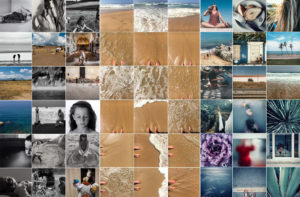 Are you confused about the endless possibilities your iPhone has in organizing your photos? Scrolling through your camera roll to find that one photo you want to show your friend? Not sure if your memories are safe in iCloud? 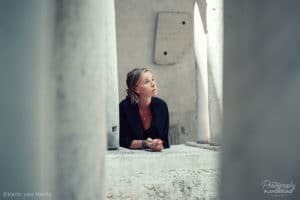 Once again Caroline Guntur, the Swedish Organizer clears things up for us in this second post about how to stay on top of organizing photos. Want to read the first post? You can find it here: Photo Organized: How to Keep your Smartphone Free of Megapixel Clutter. Thank you, Caroline, for this comprehensive and clarifying post about Apple Photos and iCloud! Keeping your photos organized can be quite the task, but if you have an iPhone and a little bit of downtime, it’s easier than you think. 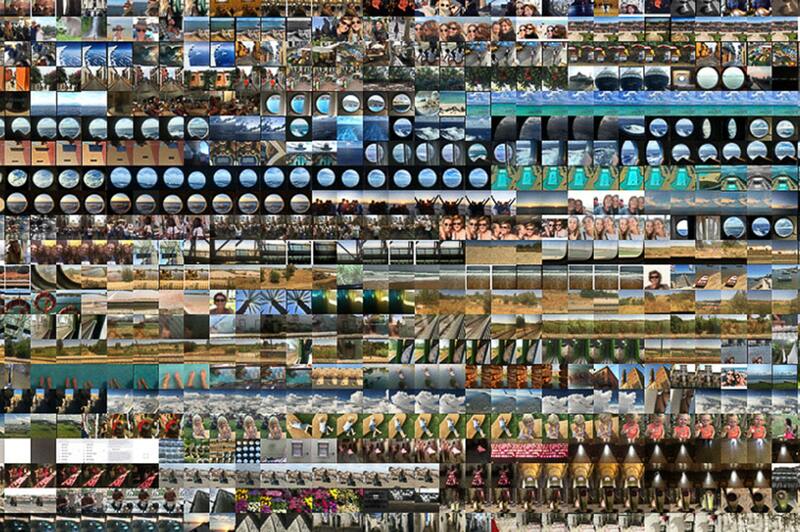 All photos taken on your iPhone end up on the camera roll. You’ve probably seen that. The camera roll is basically just a running list of all photos and videos that are saved to your device. Anything you save to your phone, such as photos from a text message or email, will show up there. But let’s be real. The camera roll doesn’t really have that many features, and you want a better way to transfer and share all those memories, right? Apple Photos is a great option for those looking for a low-maintenance system that doesn’t require a whole lot of upkeep once the initial setup is done. It’s available for free on any iOS device, and it automatically imports media from your camera roll to let you view, search, and edit all your memories in style. It groups photos by date and time taken, and it uses geo-tags and facial recognition to enhance your viewing experience. If you also enable Apple’s cloud storage system iCloud Photo Library, you can sync, share, and transfer photos to other devices and users very easily. As someone who organizes for a living, I can tell you that the most underutilized feature on any device is actually the delete button. It’s OK to be selective in your photo life. You don’t have to save everything. Deleting photos and videos that you don’t need helps free up space on your device and actually curate your library to become manageable. If you do nothing else to organize your photos, start doing this. You can quickly delete photos and videos in the Photos app from the Moments view. To get there, click on Photos in the bottom menu, then on any photo to go into the Collections view, and then on any other photo to get to the Moments view. It’s a tiered setup that allows you to see different overviews of your library. From the Moments view, you can either click on a single photo to enlarge it, view it, and delete it. Or you can delete in bulk by using the select feature. Tip: You can also use the Moments view to quickly add entire groups of photos to albums. Something to keep in mind is that iCloud is a syncing service. It’s designed to look the same on all devices so that you always have what you need right at your fingertips. Because of this, you cannot delete a photo on one device and expect it to stay on others. 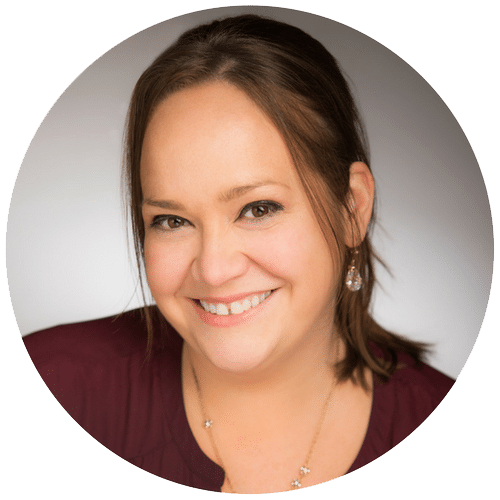 I usually tell my clients to memorize the phrase “if you delete here, you delete there,” because so often it gets confusing about what is stored where. If you lose your phone, then yes, you’re technically backed up (because you can just sync another device to iCloud), but if you delete, you’re not. Anytime you use a syncing service, you’re basically accessing the same photo through multiple devices, and anything you do on one device will reflect on all the other ones. If you use iCloud Photo Library, your photos will all be stored in the cloud, plus on any devices that have the “download and keep originals” options activated in the settings. Any device that is optimized for storage will only have smaller resolution thumbnails. Those are more than enough to view, but since they’re not the full resolution originals, you can’t really do that much with them outside of Apple Photos. But deleting always works, so take full advantage of that even if you optimize! Next click on any individual photos to view or delete it, or use the select option to grab multiple photos at once. 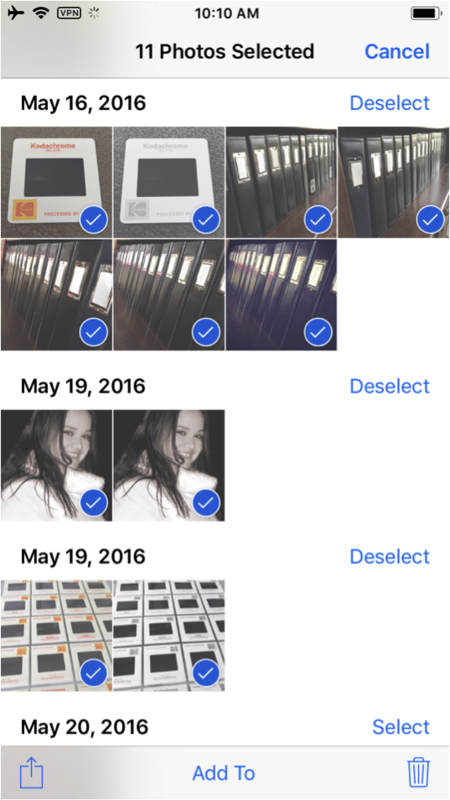 Click the trash button to send selected photos to the trash bin (Recently Deleted album). Made a mistake? That’s OK. You can head over to the Recently Deleted album to recover your memories for up to 30 days. Even if you prefer using the Apple Photos app on your iMac or MacBook Pro, you can organize on the go using just the app. A great way to do that is by creating albums. There are two types of albums in Apple Photos: Smart Albums, and regular Albums. Smart Albums are custom albums based on saved searches. They pull photos together based on metadata that you specify (like dates, people, locations, tags, names, etc) and they come in handy when you’re organizing on the desktop app. Unfortunately, these types of albums are not available on mobile devices or in the cloud, so you’re stuck with regular albums on your smartphone. But that’s OK because those are pretty great too. The regular Albums are exactly what they sound like – a group of photos with a cute cover that you name. You can put one photo in multiple albums, which is great if you have photos from an event and you’d like to organize by people or share with someone else, etc. You can create these types of “hard” albums on any device, and they show up in the cloud too, which makes it easy to organize with them on the go. 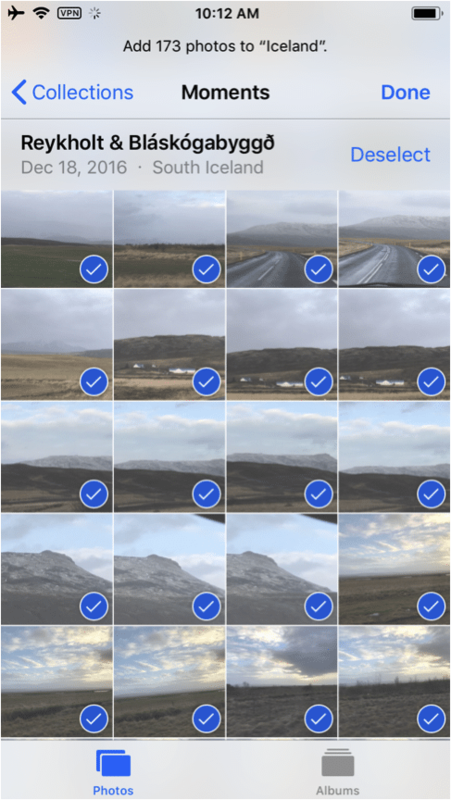 Apple Photos starts everyone off with a set of default library albums – All Photos, Favorites, People, Places, Videos, Selfies, Bursts, Live Photos, Screenshots, Animated, and Recently Deleted. Apple Photos also has a feature called Memories, which is essentially also a collection of albums that it pulls together automatically to help you remember past adventures. These are all smart albums because they’re automatically updated whenever you take new photos that fit their criteria. But they’re “hard” albums in that they show up everywhere. 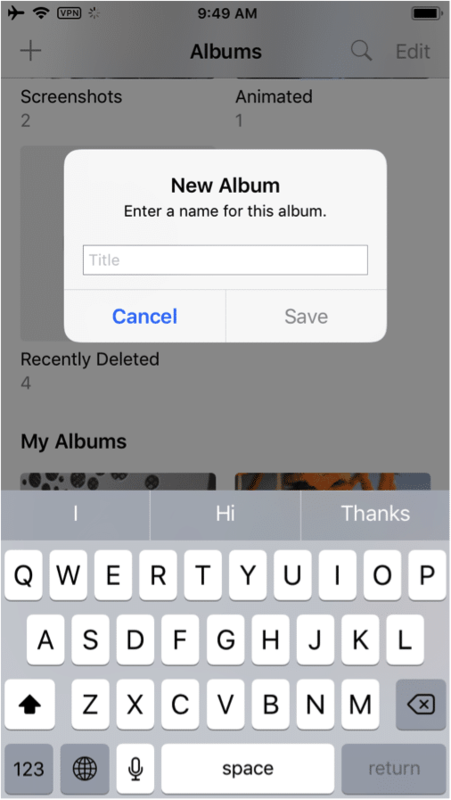 In addition to the default albums, you’re able to create your own custom (regular) albums on your iPhone. When you open the Photos app, navigate to the Albums tab to see all of your albums. The default albums will load on top and if you scroll down, you’ll see the section called My Albums on the bottom. In the top right corner, you’ll see a plus sign. To create a new album, you click on that plus and enter a name. Then you click Save. You’ll be prompted to add photos to the album from your library and to add them, you click the select link for each group you want and then press done. You can also add or remove individual photos by clicking directly on them to select or deselect. Once you have finished, you’ll see the new album appear under My Albums, and you’ll also see it update on any other device you have as well as on iCloud.com. If you have any integrated social media apps, such as Instagram or WhatsApp, they’ll show up there too. A great way to be productive is to use your downtime to create these types of albums and organize your photos. You can easily do it while waiting in line at the grocery store, or while commercials are interrupting your favorite show. A few minutes a week keeps your photo library in tip-top shape. If you’re going to use Apple Photos with iCloud, you may have to upgrade the available storage to fit your entire library. At the time of writing, your first few GBs are free, and then you can upgrade to either 50GBs for $0.99/month, 200GBs for $2.99/month, or 2TB for $9.99/month. That’s very affordable despite the fact that it’s an ongoing subscription, and it puts iCloud right up there with the other top choices for cloud storage. Even if you have a ginormous amount of video in your collection, you should find plenty of space in one of these plans, and if you have more, well then you’ll just have to hire a certain photo organizer to help you downsize. A great way to stay organized as your photo library starts to fill up is to name your albums according to a set pattern, for example, YY-MM-DD-Event. This system will help your computer and cloud solution display them in order automatically. 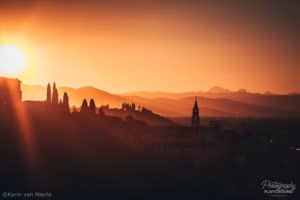 The chronological system is popular because we naturally think of our photos as a certain point in time, and we often remember occasions based on when they took place. However, there’s also nothing wrong with categorizing your albums in different ways if that’s what you like, for example, according to what it is, or where the event took place. Pick a naming pattern that fits who you are and what you want to remember, and then stay consistent with it. If you can master this concept, it’ll get you very far in your organizing efforts. Your photo collection will never be quite “finished” or “perfectly organized,” because you’re constantly adding new memories as you journey through life. That’s why the faster you get started organizing the better. Delete what you don’t need and create custom albums when you take new photos. And don’t forget to name them consistently. You’ll save yourself from the snowball of disorganization and enjoy a beautifully organized photo collection for years to come.